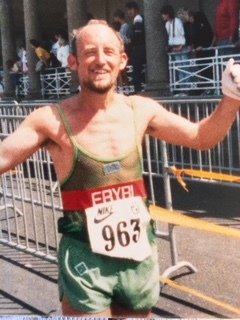 My Father Grahame Till ran with the eryri harriers in the early years of his running both marathon and fell . I have to sadly tell you , my Dad passed away 10/4/2018 . If you could let your longest serving members know as they would have known my father. I have attached a photo and details of the funeral. April 10th 2018, peacefully at his home in Tyddyn Gyrfa, Cemaes, aged 73 years. Beloved husband of the late Sheila. Loving father of Jane and Michael. Father in law of Adam. Proud grandad to Natalie and Charlotte. Son of Gladys. Dear brother of Cath. Grahame will be sadly missed by all of his family and friends.